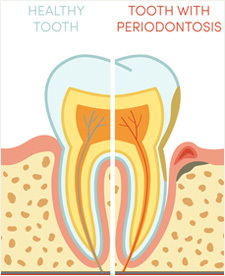 Periodontal Disease affects the gums and surrounding tooth structure.Â If left untreated, periodontal problems may evolve into gingivitis or periondontisis which are more serious but treatable. Treating periodontal disease often begins with the removal of tartar, known as sub-gingival calculus. This is commonly addressed by non-surgical procedures such as root planing and scaling. These procedures remove calculus mechanically by scraping it from tooth surfaces. Some symptoms of periodontal disease include swollen gums, chronic bad breath and loose teeth. Additional treatment will vary from patient to patient. Left untreated, periodontal disease will attack the patient’s gum and surrounding bone structure. This can lead to the need for more correctional procedures, such as bone and gum grafts. Bacteria is the main cause of periodontal disease. Maintaining your oral health is the best defense, however, other factors can also attribute to the disease such as genetics and eating habits. Left untreated, your symptoms and overall condition will only worsen, leading to a more extensive treatment plan. Contact our friendly staff today to schedule a pre-screening appointment.